WELCOME TO the fifth edition of Introduction to Programming Using Java, a free, on-line textbook on introductory programming, which uses Java as the language of instruction. This book is directed mainly towards beginning programmers, although it might also be useful for experienced programmers who want to learn something about Java. It is certainly not meant to provide complete coverage of the Java language. 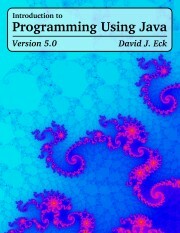 The fifth edition covers Java 5.0. You will find many Java applets on the web pages that make up this book, and many of those applets require Java 5.0 or higher to function. Earlier editions, which covered earlier versions of Java, are still available; see the preface for links. You can download Introduction to Programming Using Java for use on your own computer. PDF and print versions are also available. Links can be found at the bottom of this page. Printed versions -- I have made this book available for purchase in printed versions from the print-on-demand publisher lulu.com. This is for convenience only, for those who would like to have a bound printout in a nice form. (Please do not feel obliged to buy the printed version; I do not make any money from it!) The entire 700-page book is available in a rather thick printed version at http://www.lulu.com/content/612392. In addition, a printed version of the first seven chapters, enough for a first course in Java programming, is at http://www.lulu.com/content/559884.